"It is the task of the enlightened not only to ascend to learning and to see the good, but to be willing to descend again to those prisoners and to share their troubles and their honors whether they are worth having or not ..... and this they must do even with the prospect of death." We are rapidly approaching 13 years since the tragic events of September 11, 2001, where the facts surrounding the deaths of thousands of Americans continue in suppressed fashion, garnering yearly rehashes of the original narrative. As calendar pages turn, so fades public interest and perhaps attempts at outreach and education regarding the facts. 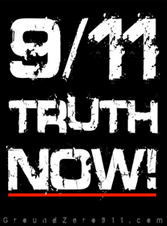 As time goes on, 9/11 truth is teetering on the edge of enmeshment with other obscured events which carry the scarlet letter of "conspiracy theory," and thus, with a public in the dark, the implausible official stories are passed on, but not legitimately investigated. Ground Zero 911 coalition is determined to prevent the lapse of the facts into an eternal blurry memory hole. They are hosting a three-day event, starting Thursday September 11, to bring major awareness and keep justice and accountability alive at Ground Zero near the 9/11 Memorial & Museum. On the website, you will find a request for volunteers, donations, and, most importantly, involvement. You will also find pages dedicated to assisting you with lodging, travel, and directions, if you are traveling from outside New York City. In addition, you will find a number of other resources for spreading the information regarding the facts surrounding the 9/11 attacks such as Essential 9/11 information and 50 verifiable FACTS about 9/11 .The value of this information cannot be over emphasized for those who may still be on the fence regarding their assessment of the events of 9/11 - or, who might wonder why this event draws family members of victims. There will be vital outreach efforts happening at Ground Zero near the 9/11 Memorial & Museum to inform the public about what they won't find in the museum which completely renders the museum a $700 million monument to the deliberate falsification of the meaning of 9/11. There will be a press conference calling attention to the fact that over 2200 professionals in the building sciences agree on the evidence of controlled demolition, the media breakthrough that just occurred on C-SPAN, and the creation of an alternative "audio tour" of the museum which educates the public with facts about 9/11 which the media has chosen to suppress. There will be a screening of "Anatomy of a Great Deception". There will be a symposium with speakers such as Richard Gage, Barbara Honegger, firefighter Rudy Dent, a 9/11 survivor who will be speaking for the first time at an anniversary event (see more below), and family members Bob McIlvaine, Vance Green, and Catherine Montano. More speakers are being confirmed. We'll also do an outreach action at the NY Times building, and Union Square to reach New York residents. There are plans for a social gathering as well. Any profits made from the event are set to go to a fundraiser for 9/11 first responders. 9/11 cannot be relegated to yet another forgotten piece of history whose true relevance will be lost among a sea of historical fallacies and watered-down explanations. We cannot allow the truth about what happened in 2001 to be forgotten. We cannot allow those truly responsible to continue to go unpunished. For that reason, we must do what we can to keep 9/11 truth alive. Please visit GroundZero911.com and contribute in whatever way you can in order to make this street action a successful event. If you cannot attend the action in New York City, please starting or joining one of your own in your area. Or, supporting the effort of education by sharing with those you know.